Recently in the northeast it has been raining a lot; more than usual. It seems as though April came late and is coming with a vengeance. Though it is easy to miss the bright sunny days, one thing that comes with the rain is growth. You can see all around the plush green trees and bushes. Plants everywhere are loving this weather as they grow to their fullest, stretching their limbs as far as they can reach. All shades of green are accompanied by flowering trees and shrubs. Life is a beautiful thing. You can truly appreciate the rain when you see what comes with it and that does not exclude vegetable gardens and their spring crops. Your own personal garden may be starting to show some vegetation at this point, that is if you started planting a few months ago. Farmers markets have started to open and do have all these fresh vegetables available. You know you are getting good ingredients from a farmers market as they are picked from the dirt and brought straight to their stands. Things in season now, include cucumbers, radishes, asparagus, peas, spring salad mix, some tomatoes and more. 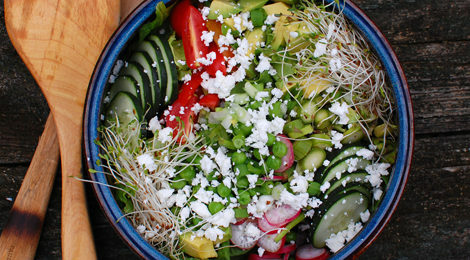 We included all the in season veggies that we could find to make this salad as fresh and tasty as possible. There is nothing too complicated here. No fancy dressing to top with. We used the ingredients in their pure form and decided to dress with a light dressing; some olive oil and lemon juice. This way we can allow the ingredients to speak for themselves. 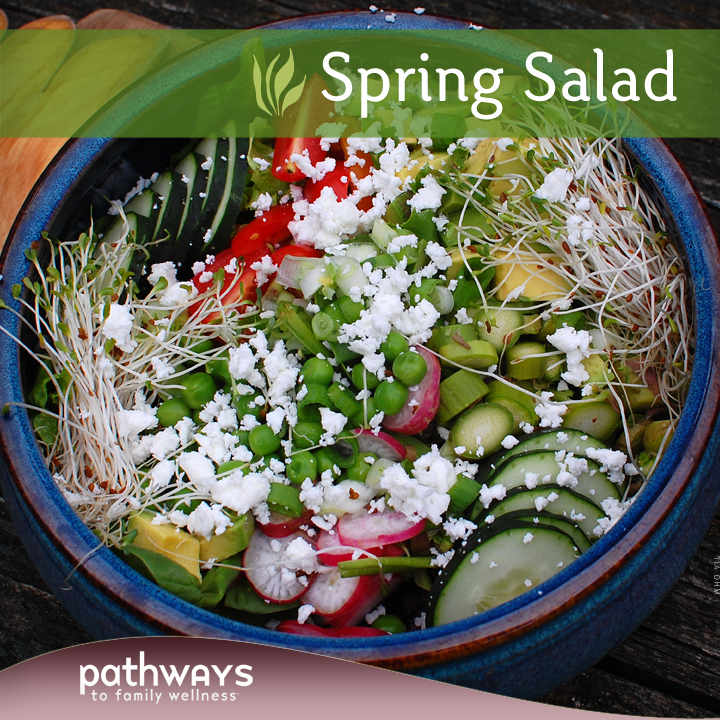 You can taste each topping with every bite as you enjoy a fresh spring salad on these delightful spring days. If you are cooking your frozen peas (suggested), do so as package instructs and let cool. Rinse your lettuce and put in your favorite salad bowl. Top with peas and all of the remaining toppings. Dress with salt, pepper, fresh lemon juice, and olive oil all to taste. Enjoy immediately for best results.